There is always alot of questions about whether to use the 32/36 carb or the 38/38 carb when selecting a conversion kit. Here is the real difference which should make it an easier choice. The 32/36 Conversion will give you a little more power but the Truck/Car will run excellent. You want to use this when your Engine is STOCK and the goal is to have your truck run good but more power is not a real concern, just reliability and the end to messing with the stock carb. The 38/38 will make ALOT more power and Torque and is a MUST for anyone running Larger than stock tires, Off-Roading, or has any engine modifications such as Headers, Exhaust, Cam Upgrade, Higher Compression, Etc. This is the Highest Performance best Torque and throttle response carb. 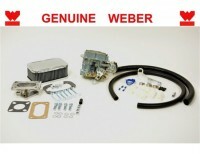 All Weber kits are complete with NEW Properly Baseline jetted Weber Carb, Adapter Plate to stock intake manifold, complete linkage kit and Chrome Air Filter or Stock Air Filter adapter as required. Instructions and needed hardware.